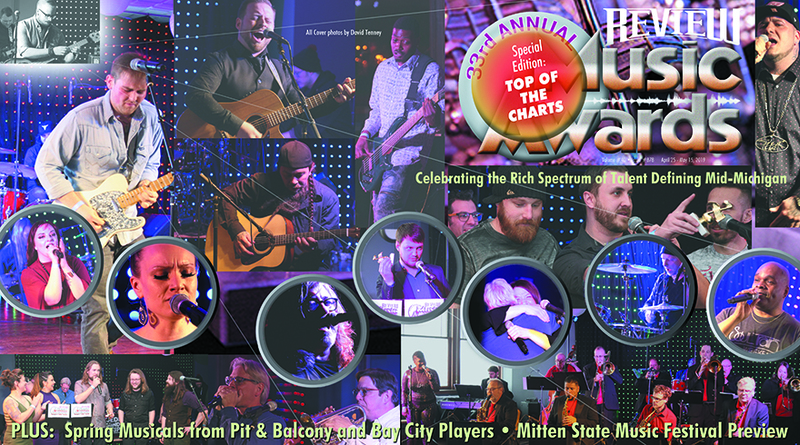 All of us at The Review are excited and busily preparing for our 33rd Annual Review Music Awards Celebration at LumberBaron’s Brewery, which will be held on Sunday, April 14th from 5 PM – Midnight and staged in their beautiful Genevieve Ballroom, which is located at 804 E. Midland Street in Bay City. Doors will open at 4:00 PM and the public is welcomed to attend and celebrate the talents of hundreds of regional musicians spanning multiple genres of music! This annual celebration will also serve a dual function to commemorate the 40th Anniversary of publishing Review Magazine, which delivered its first edition back on April 4th, 1979; and is focused upon honoring the creative, talented and committed musical artists & individuals that cultivate the creative spirit and nurture the musical soul that defines and distinguishes the unique musical sound of our region. It is the only awards ceremony of its kind that connects people, audiences and artists together insofar as the public at large determines the honorees & recipients. But most importantly, the single purpose of this ceremony is to bring greater community, statewide, and national recognition to local talent, which we feel has a rich history of being one of the strongest in the state, and giving it the proper notoriety and attention that it deserves. Guest personalities, cultural, and community leaders will assist in handing out awards the night of the ceremony, while a strong list of regional performers will headline this year’s show with live performances. A retrospective of musical history in the making that spans performance highlights and special moments from the past 32 years of The Review Music Awards. Review Magazine Publisher & Editor Robert E. Martin welcomes nominees and attendees and recaps the voting procedure utilized for this year’s celebration. Comprised of musicians that are experienced veterans of local concert, variety and swing/ballroom dance bands that have performed in and around the Great Lakes Bay Region over the last 25 years, this remarkable group is a 15- piece band comprised of 10 horn players (saxes, trumpets & trombones) a 4-member rhythm section (bass, guitar, keyboard & drums) and our premiere vocalist Dena Pruitt. Each member of the band carries a semi-professional performing resume which includes the variety of ensembles mentioned above. The Saginaw Elite Big Band will cover and perform music pieces ranging from jazz to high energy swing and ballroom dance standards. Formerly a member of the award-winning Country-Rock hybrid Tweed & Dixie, tonight Billy will be performing original material from his newly recorded project with producer Andy Reed. Accompanying Billy will be drummer Dalton Thomas; bassist Ricky Ford; and utility player Kevin Rousse. 7:15 – 7:50 PM • ADABOY! This original Alternative Pop/Rock band strives to perform music that moves you through emotion, mind and/or spirit. ADABOY! is comprised of Steve Bennett on drums, Joe Balbaugh on bass, Jake Voisine on lead guitar and Mike Richards on Rhythm Guitar. Former Recipients of the 2016 RMA for Best New Band and Best Album Release, this group is made up of musicians from different backgrounds, but with a commonality of creating something new and exciting. Rosco Selley has been a fixture on the mid-Michigan music scene for a few decades now, working with such notable groups as Blues Controversy and Maybe August. Tonight’s line-up consists of Donny Brown (drums); Loren Kranz (keyboards); Mike Robertson & Scott VanDell (guitars); Andy Reed (bass); Jen Cass, Amy Petty, Michelle O’Neil and J.D. Dominowski (vocals) and harmonica (Rosco Selley). The FOR Collective grew out of Rosco’s desire to assemble a group of A-Class musicians and guest vocalists to match with original songs that he wrote, developed specifically with each vocalist in mind. The results have been outstanding, including an incredible original release, which is a stunning achievement. We hope you enjoy! The Dramatics, Bobby Byrd, Martha Reeves & the Vandellas, as well as Rock Legends such as Bad Company, Edgar Winter, Foghat and Davy Jones. Soul Xpress is an exciting live act that ignites crowds with their exceptional showmanship and funky grooves. Mike Spitz (aka Spitzer) brings a unique raw emotion and real life perspective into his work that is difficult to find in the manufactured mythology of today’s music industry. With this latest release (Best You Never Heard) Spitzer achieves a much deeper intensity of understanding, placement, and wisdom with his music, which weaves a connection to salvation through lyrics that map a musical odyssey grounded by fundamental values of family, self-respect, and faith in those that shape worlds looking beyond that of narrow self-interest. Joining him will be co-creators, Shawn Yancer, Kyle Mayer and Cory Peterson.